Ambiance Audio Design & Security, Inc. Experience the thrill of owning a state-of-the-art home theater at an affordable price. Never before has the concept of a home theater been so real and achievable.The products that make up a home theater are experiencing price wars which has dramatically reduced the overall cost of our custom home theater packages, greatly benefiting our most valued customers. HDMI, 1080p, 4K, LCD, 5.1 or 7.1, etc. Are these terms you should be familiar with? Not necessarily... but they are still each very important to the setup of today’s entertainment rooms. That’s exactly why we are here to help. With technicians educated on the very latest in audio and video technology, we are well equipped to meet your Media Room needs. Whether your looking for an aestetic seemless install of a large LCD over the fireplace or simply wanting that perfect surround sound experience, we are the one to call. 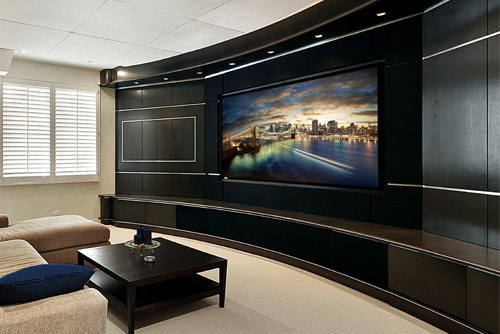 Television size, speaker setup, component capabilities, remote programming, and more are all taken into account to deliver the Home Theater or Media Room that will blow you away. Copyright 2019 Ambiance Audio Design & Security, Inc. All Rights Reserved. Designated trademarks and brands are the property of their respective owners.